I love food. Plane and simple, food makes me happy. I love the social aspect of eating around a table, the laughter, the chatting. It just makes me feel content. Well Las Iguanas, the popular latin american inspired food chain, encourages you to do just that. In fact, despite Nik and I being invited to the re-launch of the Thurrock Lakeside branch of the chain for a complimentary meal, we were told straight away that it was an invite with no strings. Walking through the doors, we were greeted by the area manager (and gorgeous dancing ladies dressed in carnival attire, complete with feathers on their heads), and told that they expect nothing from us other than our honest feed back and that we have a good time! I was under absolutely no obligation to write this post, but I was so impressed by all that I learnt about the chain, that I wanted to share. 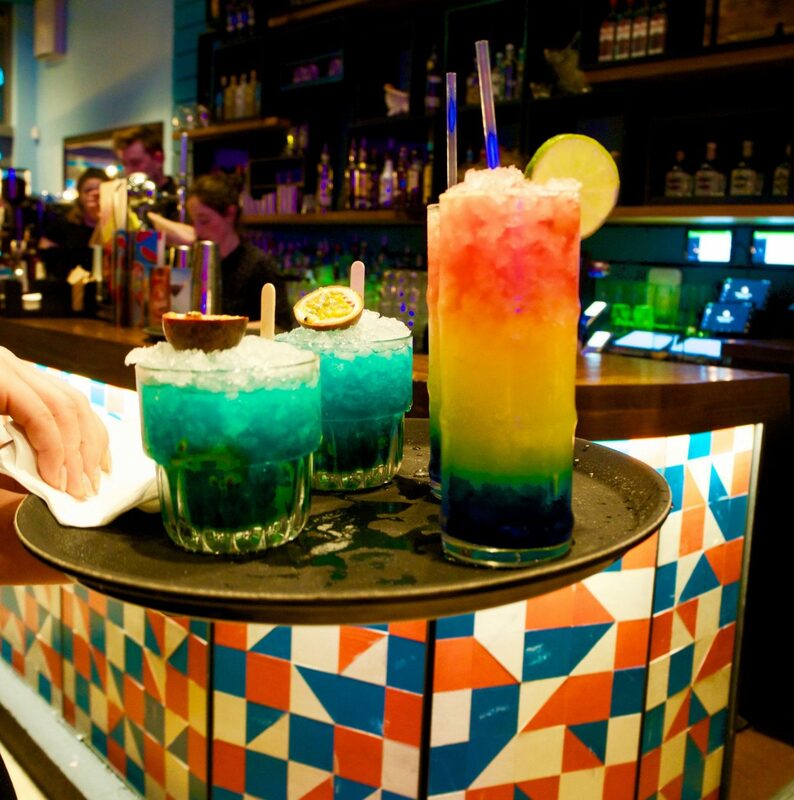 If you have been into any of the Las Iguanas restaurants, you will be familiar with the bright, lively vibe that the chain has. Colourful walls, painted art and a well lit bar straight away tell you this is a place to be sociable and enjoy. There is 2 for 1 cocktails on offer, (don’t mind if I do) as well as a huge, extensive new menu inspired by the foods of Brazil, Mexico, Argentina and Peru. A food lovers dream! A lot of the Las Iguanas restaurants are over two floors, and it was the case in the Lakeside one too. Downstairs you have the tables for eating, (that are not on top of each other like some places) upstairs is a more party vibe with leather couches, large bar, dance floor and outside seating area. I loved how the upstairs had little cosy corners for when your feet needed a rest from showing off your moves on the dance floor. At my age, those couches are a godsend…. So, back to the food! Since I became vegan 4 months ago, I have not struggled to eat out, but if I am honest, choices have been fairly limited. Well my vegan and vegetarian friends, Las Iguanas have delivered in a big way. A huge way! There is a completely seperate menu for us vegan/veggie people. It turns out that the marketing team at Las Iguanas, have no less than four vegans on their team, so my beauties, we have friends on the inside….. Yayyyyyy! After much deliberation, and help from our fabulous waiter, I chose to have the vegan nachos to start. It was a hard choice as there was so much that appealed to me. Jackfruit tacos, Mexican salads, ensalada, ohhhh there was a great choice! Nik chose a cheese fondue, which to be fair, looked amazing! The starters were huge so I would suggest that a starter between two could work if you wanted three courses. We had starter and main, but neither of us could manage a desert, so be forewarned. They love to feed you here! My nachos were absolutely gorgeous. 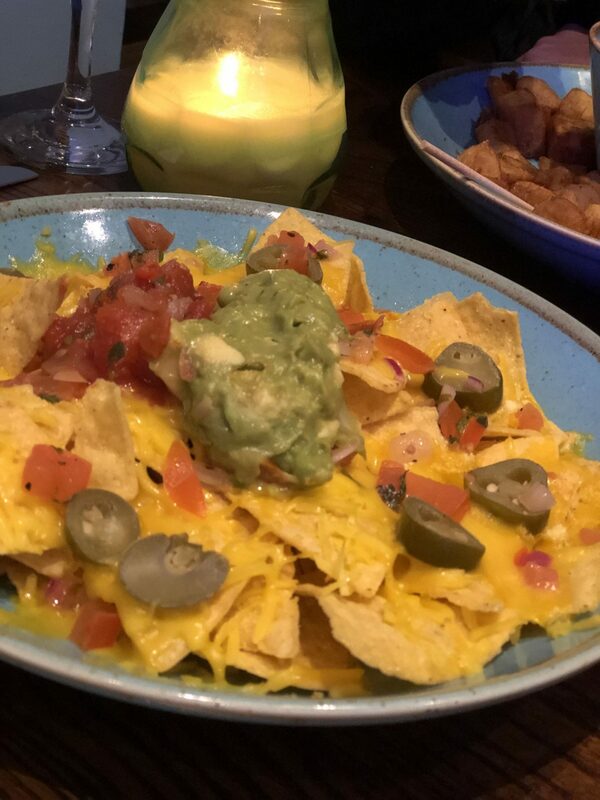 Vegan cheese was melted over the top of the nachos with zesty salsa, tangy guacamole and jalepino peppers served on the side. Gorgeous! 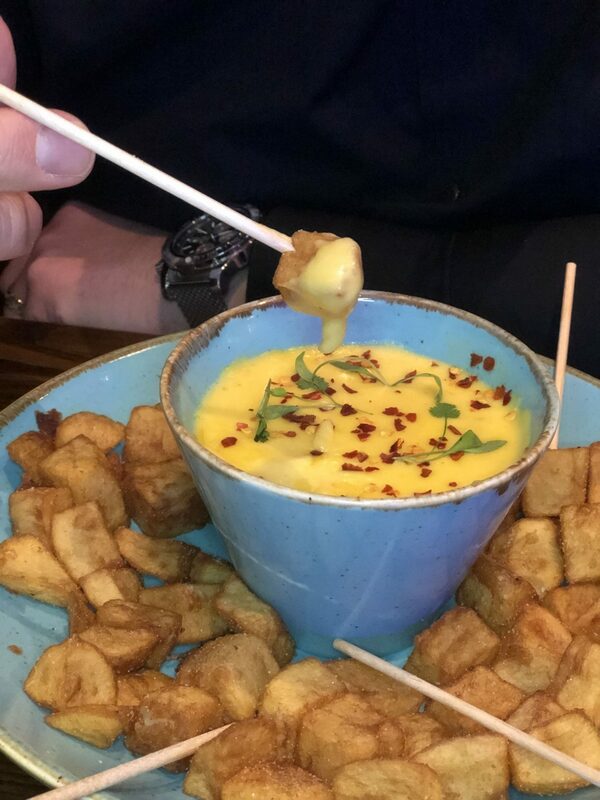 Nik’s fondue was the perfect mix of melted, gooey cheese alongside chunky potatoes bravas for dipping. He said it was beautiful. Our starters, alongside our cocktails, were the perfect introduction to our meal. Next came trying to decide on the main meal and again, I was unusually spoilt for choice. It’s worth noting here that the staff really do know the menu. They have a passion for the food, and enthusiasm to help you choose the right dish. Fantastic staff. In the end I opted for vegan fajitas (I nearly went for the vegan chilli). It sounded lovely. Huge portobello mushrooms were grilled and mixed with spices, onions and peppers. Soft, warm tortilla wraps were provided to wrap my sizzling mushroom mix up in, and vegan cheese, guac, and roasted tomato salsa accompanied. Nik went for havanna club and jerk pork bbq ribs. A whole rack of ribs, covered in a sticky, sweet rum glaze. He said they were amazing, and again, incredibly filling. 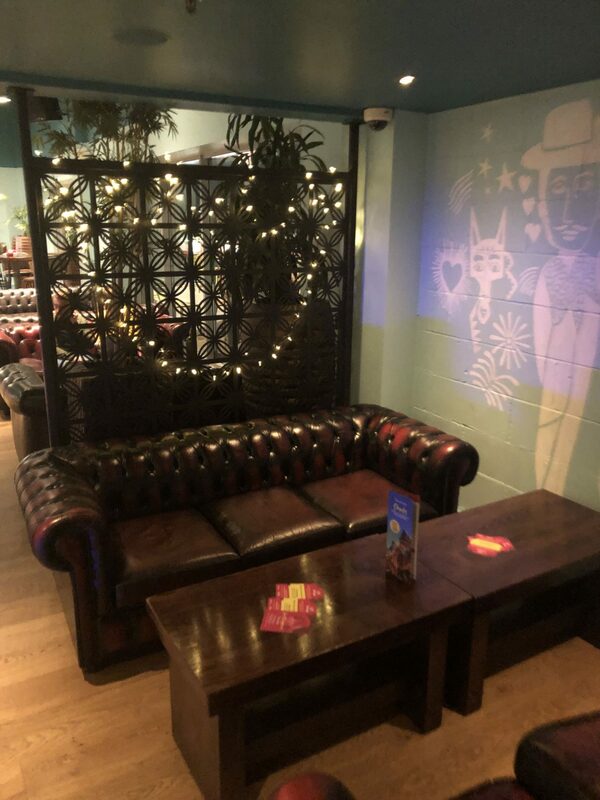 If you like the idea of having a bit more of a party at Las Iguanas, they have so much choice for you to get you in the swing of it. Cocktail making masterclasses, bottomless prosecco brunches, punch bowls the size of small planets and, my particular favourite, the cocktail trunk! A travel trunk packed full of all you need to make your cocktails at your table…I imagine they could be pretty potent…. You can see full details right here. In between courses, I was speaking with the manager, and she was telling me about the behind the scenes ethos of Las Iguanas, and it spoke to my soul. Las Iguanas are involved in a number of community projects, both here and abroad. They have been supporting these projects, some of which I have listed below, for over 5 years, making a huge difference in these communities. I love resaurants with a back story, and told you about another one in this post, Vegan menu launches at Lebanese chain. The Lata Foundation – Based in Brazil, the project provides kids with the opportunity to learn English, ballet and hip-hop, as well as supporting the families to keep their children out of gang culture. The Lata foundation also have projects to help save the rainforest in Costa Rica. 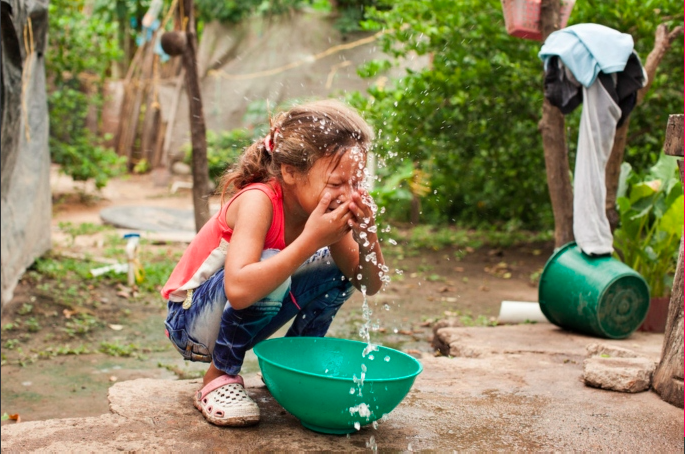 Belu Water – This project gives 100% of its profits to WaterAid, the charity to provide clear drinking water, decent toilets and good hygiene for all within a generation. 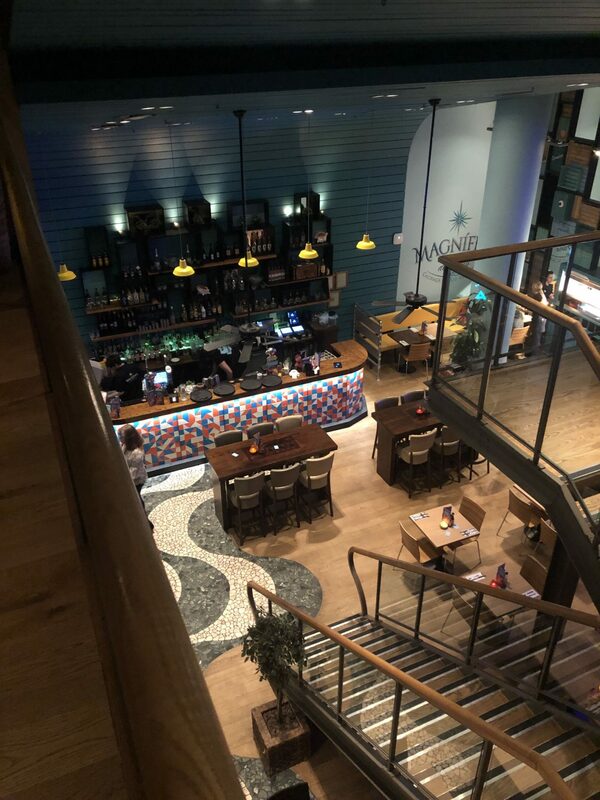 Las Iguanas stocks the clear glass water bottles that are 40% recycled ethical glass as well as supporting the project. Friend Finder – Helping chronically ill and disabled children find friendship so they don’t feel so alienated, and can have fun. The restaurant chain provide fun mocktail master classes for the kids, as well as having gatherings to enjoy the food. There are many more projects that Las Igunas support, and I was blown away how involved they are in community projects. I could write a whole blog post just on the work they are doing in communities as well as where they source their ingredients from, their commitment to buying only from places that have welfare standards for their animals etc. I have tried to give you just an example of their ethos. I absolutely love that, and businesses that give back will always get my money. In fact, I have chosen there to eat this week with my family for my birthday meal! I better start perusing the menu now…..especially as they have a vegan chocolate coconut tart on the desert choices…. I hope I have opened your eyes to more than just the menu on offer at Las Iguanas. They really are a business with an amazing menu, and amazing ethics. I applaud them for having such a fantastic menu for us non meat eaters, and I think its a place you can have fun with your partner, family or a good ole girls night out! A full copy of the menu is here if you would like to see it. I would love to know what you think about the information in this post. Has it come as a surprise to you how well they cater for non meat eaters? Was you unaware how involved they are in such amazing project work? Would it make you check them out now knowing this? Is it important to you that the places you eat at have a commitment to an ethical way to source ingredients etc? Do you know any chains/restaurants that have a good ethical approach that you can recommend to me? **Please note, we were invited as guests to Las Iguanas, so therefore our meal was complimentary. However, I was under no obligation to write a post and all views and opinions are of course, my truthful and honest opinion. "Hotel Room with a Garden in the Heart of London"
The cocktails were going down a little too easy……… Funnily enough, I am writing a post on my vegan experience so far. A few people have asked so I have typed up a post. I just need some photos!